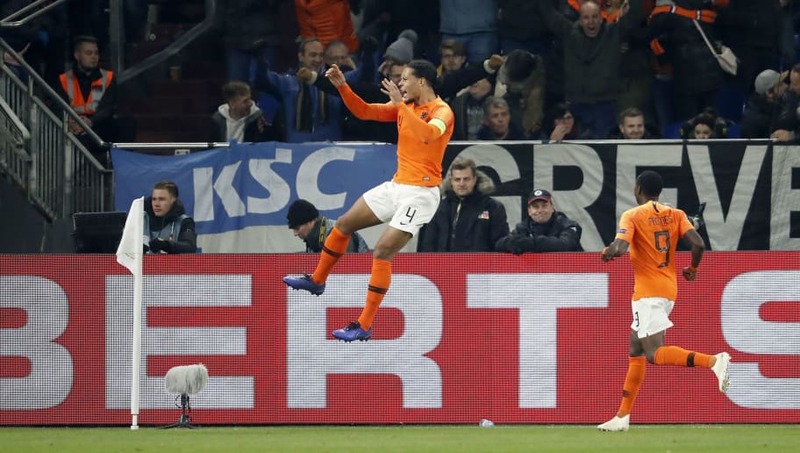 ​The Netherlands dramatically qualified for the Nations League finals on Monday night after a rousing comeback against Germany - recovering from 2-0 down to draw, with Virgil van Dijk scoring an equaliser in injury time. The Oranje only needed a point to qualify alongside England, Switzerland and Portugal, and Ronald Koeman's side appeared dead and buried at 2-0 down. But with five minutes left, Quincy Promes gave the Dutch a lifeline with a smart finish, before Van Dijk powered in to send Dutch fans delirious. Timo Werner opened the scoring for Die Mannschaft in the first 10 minutes with a fantastic finish on the half-volley, and 10 minutes later Manchester City midfielder Leroy Sane doubled their advantage with a deflected strike past Jasper Cillesen. The home side had complete control over the first 45 minutes. But the second half was a different story, as the Dutch battled back to seal a place in the finals in Portugal next summer. All the talk before the game was about the Netherlands' resurgence in international football, but Germany reminded everyone of their quality tonight as they were in complete control for 85 minutes of the game. Joachim Low's side lost their concentration however twice in the last five minutes and now as a result, Die Mannschaft drop in to Pot 2 of the Euro 2020 draw to cap off a miserable year. This has been the worst season for Germany in nearly 80 years. Starting XI: Neuer (6); Sule (7), Hummels (7), Rudiger (6); Kehrer (6), Kimmich (6), Kroos (7), Schulz (7); Gnabry (7), Werner (7), Sane (7). Timo Werner took his first-half goal superbly, slamming in a half-volley on the turn, and showed why he is one of Europe's hottest talents right now. He combined with other forwards Sane and Serge Gnabry superbly as they managed to exploit the space in front of them. Although not many of the German team were poor, Joshua Kimmich did not have the influence as some of his other fellow midfielders. He gave the ball away cheaply in the first half but was comfortable in the second before the madness of the last five minutes. Kimmich was guilty of being too relaxed as the Dutch changed the face of the game. The Dutch never really got going in this game, and never matched the tempo and inspiration of their heroic win over France. Showing signs of lethargy following the win last time out in Amsterdam, they still somehow turned the game around. They exploited the Germans' defensive fragility and completed a memorable comeback.   Virgil Van Dijk equalises for the Netherlands in the 90th minute! It goes to show that despite the promise from the Netherlands, Ronald Koeman's men also have the character to overturn results and will take great heart form this result going forward. Starting XI: Cillesen (4); Blind (5), Van Dijk (5), de Ligt (4), Tete (6); F de Jong (7), Wijnaldum (5), de Roon (6); Babel (5), Depay (5), Promes (7). Although overshadowed by goals from Promes and Van Dijk, Frenkie de Jong's energy did try and pump momentum into a tired Netherlands performance before the crazy last few minutes, and was their stand-out performer for the duration of the 90 minutes. Although Matthijs de Ligt has been outstanding recently, he did not have his best game in Germany. His lack of positioning was exposed for the opening goal and he was uncomfortable with the threat of German striker Werner all night. Although he is a fine young defender, his suitors across Europe did not watch his best performance. At the end of the international season, Germany will take stock after a disastrous year, while the Netherlands will celebrate taking another step from the international wilderness following this successful Nations League campaign.